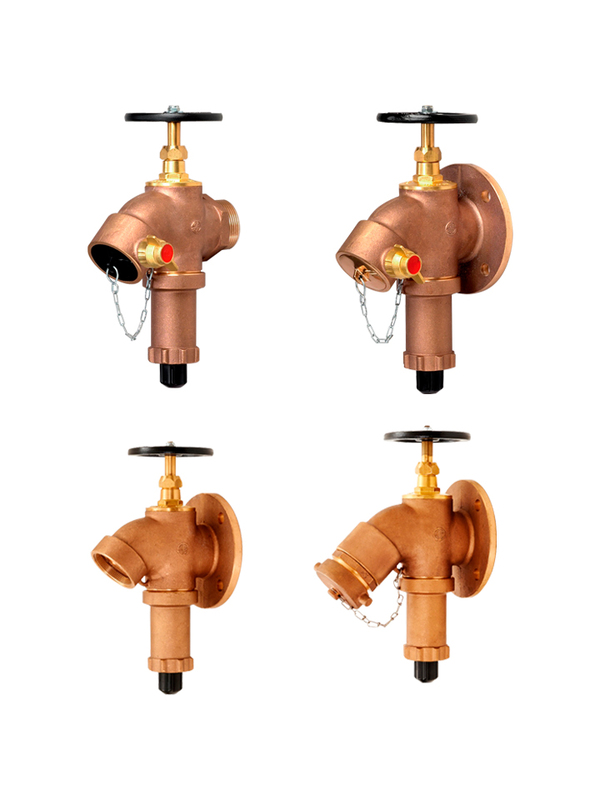 “AE” 65mm diameter Gunmetal high-pressure “Bib-Nose” pattern regulating hydrant valve is field adjustable which allows the user to set the valve outlet pressure as desired according to the conditions of the fire protection system in which the valves are installed. The valve comes with screw (Fig.138) or flange inlet (Fig.139FG) connections. The design and construction of the hydrant valve are strictly in accordance with BS5041 : Part 1 : 1987 and generally to BS5154 : 1991 standards. It is suitable for connection to a high pressure water supply of up to 21 bars (300 PSI) and provide a constant reduced outlet pressure which can be set in-situ during testing and commissioning of the fire protection system. This constant uniform set outlet pressure of the valve, irrespective of its’ location in which it is installed either in a high rise building or off-shore plants safeguards the fireman from inconsistent hose pressures in a fire situation. The selection of the materials in the manufacture of the valve are all corrosion resistant, tough and durable. This ensures the product long-life plus providing an efficient service in the time of need. The shut-off of the valve for good water-tight sealing is achieved by using a high quality rubber bonded seat disc which acts as a primary rubber to metal seal, whilst a secondary metal to metal shut-off is also incorporated in the design of the valve. Every hydrant valve manufactured is hydrostatically tested to 22.5 bars and 30.0 bars for the valve seat and body respectively. The valve outlet static pressure is factory preset at 7.0 bars (100 PSI) as required in the standard. The internal casting finishes of every valve is of high quality ensuring a low flow restriction that meets the standard’s water flow test requirement. The hydrant valve comes complete with standard “black” (“Red” is optional) plastic blank cap and chain. Alternative blank caps made of aluminium, brass or gunmetal are available on request. • Compact and elegant design with excellent flow characteristics. • High quality casting finishes. • Primary shut-off by rubber to metal and a secondary metal to metal seating. • Corrosion resistant and quality materials used for durability, long-life and efficiency. When the valve is open, the inlet pressure flows into the upper part of the pressure chamber. By adjusting the spring below, a balance pressure of these two forces determines the degree of the valve opening to maintain a constant outlet pressure. When the valve outlet pressure is regulated, it will remain set unless it is being tempered. The valve outlet pressure setting can only be regulated under a “flowing” condition. A small flow coming out of the valve outlet is sufficient to perform the task. The valve counter-balance spring design allows the outlet pressure range to be regulated between 3.5 and 12 bars. The inlet pressure ranges from 5.7 to 21 bars. Inlet : 65mm dia Male BSPT or BS4504 PN16 flat-face flange. Outlet : 65mm BS336 female instantaneous. standards are available upon request. • TUV-SUD-PSB Listed under Class 1A (Singapore). • SETSCO Listed under PLS Class 1A (Singapore). Associated Enterprises (S) Pte Ltd was incorporated in 1968. The main line of business was in the import, trading and servicing of fire extinguishers. As the business expanded, the company started its' own manufacturing facility in 1973. If you have any queries or information needed, do contact us or submit this form and we will get back to you as soon as possible.